I’ve been caving before and I’ve seen tons of unbelievable waterfalls in my life, but I’ve never gone caving to get to an underground waterfall before. 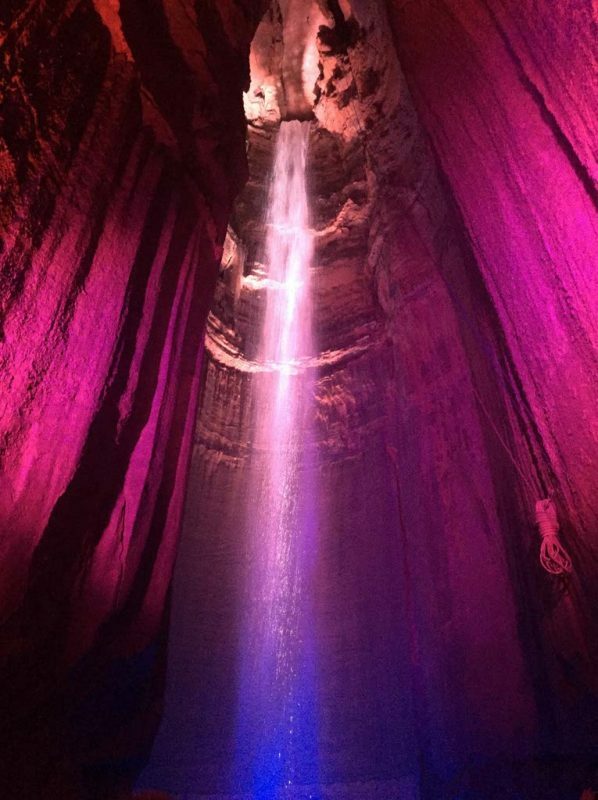 I might not even have known they existed before seeing a photo of Ruby Falls in Chattanooga last year. The moment I saw it, I knew it needed to go on this year’s list. Ruby Falls is a breathtaking waterfall located over 1,120 feet below the surface of Lookout Mountain in Chattanooga, Tennessee. Today, Athena and I, along with two other families, descended 260 feet into historic Lookout Mountain by elevator. Then, our tour guide led us along the cave path where we discovered many unique geological wonders. Near the end of our journey, we heard the thundering roar of breathtaking Ruby Falls. 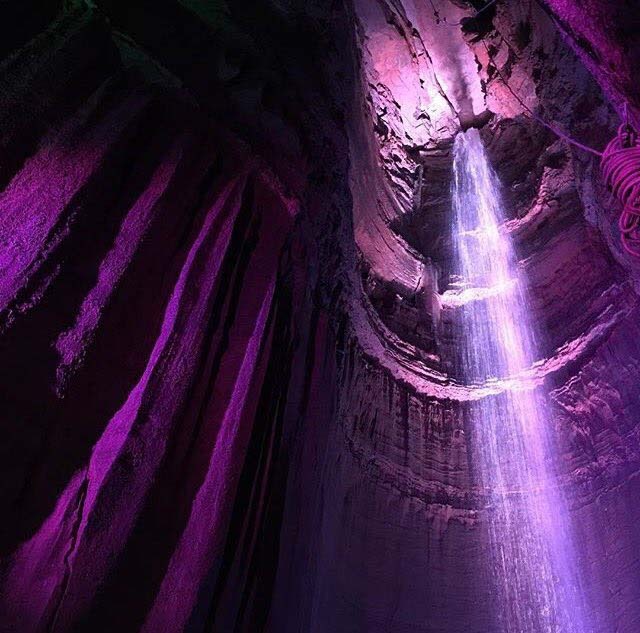 1120 feet underground, Ruby Falls is America’s tallest and deepest underground waterfall open to the public, and it’s as magical as it sounds. After an introduction to Lookout Mountain and Ruby Falls, we descended by elevator to the beginning of the cave hike. It was a pleasant surprise to walk the entire distance to the falls without needing to bend or crawl. Along the path, we discovered stalagmites and stalactites that formed many interesting shapes. The man-made lighting highlighted many of the shapes and created a magical world underground. I felt like I was at Superman’s Fortress of Solitude at times. 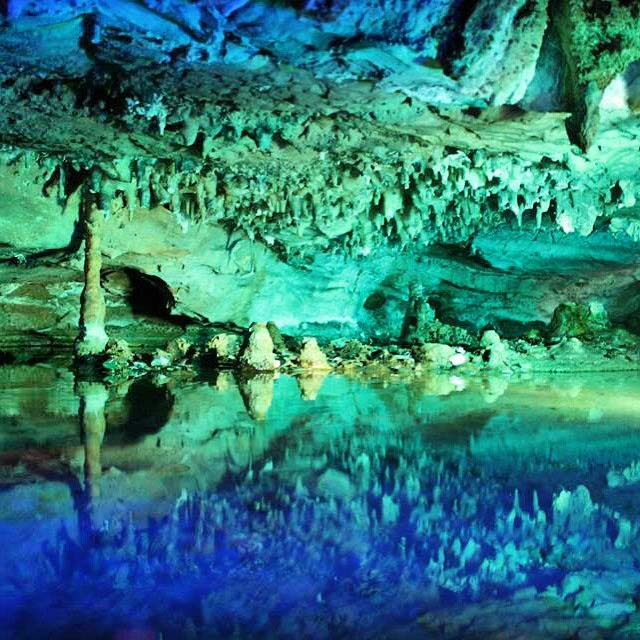 Some sections of the cave had crystal blue water along the sides of the path that created reflective pools. I knew that the main attraction was still to come but I couldn’t help stopping every few minutes to take a photo of all the beauty that surrounded me. It’s amazing how different every cave is. There is so much to discover underground. When we neared the falls, the cave opened up to the height of several story building. I could hear the power of the falls getting closer and closer. At first, it was dark. I could tell that the falls were close because of the sounds and the mist brushing my face but I couldn’t see anything. Then, the lights and music came on. The lights changed from greens and blues to reds and oranges. With every shift in color, the falls took on a new life. Athena asked me if fairies were changing the color of the falls. I knew that it was just man-made lights but I still felt the magic. We were over 1000 feet underground yet we were witnessing a waterfall. We returned by the same path that we entered but I was still living in the moment when I first watched the lights come on at the falls and the return to the surface was a blur. Luckily, I took tons of photos on the way into the falls so I didn’t miss out. Seeing Ruby Falls in Chattanooga is one of those moments where you believe that a higher power must exist in the world. How is so much beauty possible? And to be hidden underground waiting to be discovered. What else is out there that we still don’t know exists? Family friendly Chattanooga was packed with fun adventures, like visiting Ruby Falls, for all ages. It was a surprising destination to add to our bucket list but once we visited, we were hooked. We highly recommend discovering new adventures in the Chattanooga area. I have heard of this place and been through Chattanooga lots of times via the I-75 but never visited- wow!!! Such beauty hidden so far underground, amazing. I would love to visit this place! It looks gorgeous! It is beautiful. When I saw a photo of it last year, I put it on my list immediately. It is even prettier in person. The pictures are spectacular! Such great clicks and I enjoyed reading the description. Made me feel i was there ! Great post. 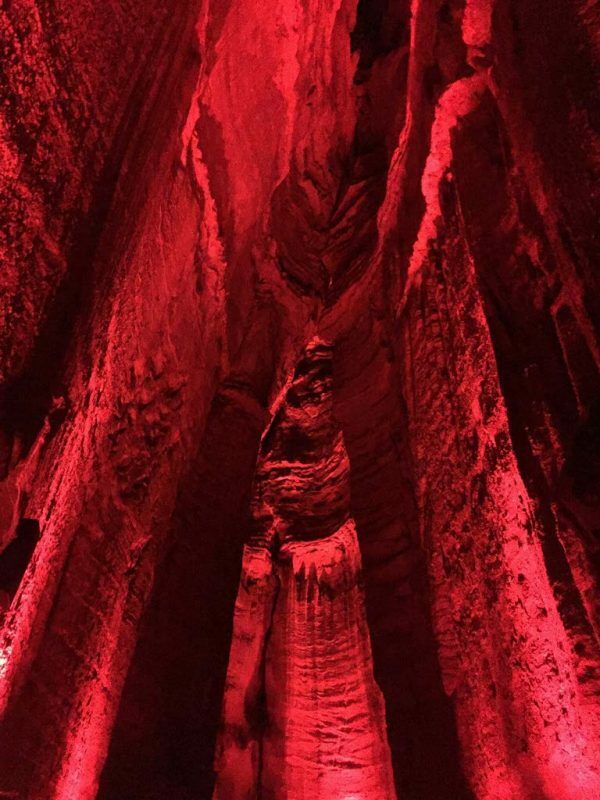 I’ve never been caving, but these photos of ruby falls are convincing me that it might be worth doing one day. Such pretty photos. I would love to see this in person. I love the colors. I have never been caving, but this looks great. Our Planet has so many hidden but yet beautiful secrets! I have never seen an underground waterfall, but talked a technical diver the other day, who told me about many beautiful caves like this one. You are so lucky to have seen it in real! Wow that’s amazing! I think in this case the lighting made the place look more surreal and dream like! Your photos are incredible. I have to admit I stared at them for quite a while! Wow this is like walking through a rainbow! How gorgeous! What a beautiful place to visit! I would love to go exploring as long as I knew that I could get out! If I can’t stand up I start getting a little claustrophobic but for that view… I might risk it! Beautiful pictures! I would be TERRIFIED to do this, but I guess things probably wouldn’t be on your bucket list if they weren’t a bit intimidating! YOLO! Have fun exploring! Wow this is definitely different and with colored lighting that changes, I would really have a fun time doing some photography in there. Looks like a fun place to explore. What a gorgeous discovery. I hope we have a reason to make it to Chattanooga. We live in NC and headed to Transylvania County which is called The Land of the Waterfalls because it has 250 waterfalls. We hiked to the bottom of the falls where the Hunger Games and Last of the Mohicans were filmed. Absolutely stunning. Thanks for sharing this gem. The colors in the photos that you’ve shown are gorgeous. I went caving a couple of times before (to the same place). We were underground with the only light coming from our helmets. My favorite part was wading through this chest-deep ice-cold chamber of water. Nothing colorful about what I experienced….and no waterfalls…just this area where the drop was deadly and you could pitch a rock in it, and not hear the aftermath. We’d turn our lights off, and it was an unnerving experience. Love all the colors! Ive done a little spelunking but I definitely want to do more! We have never been caving but certainly would love to give it a go. 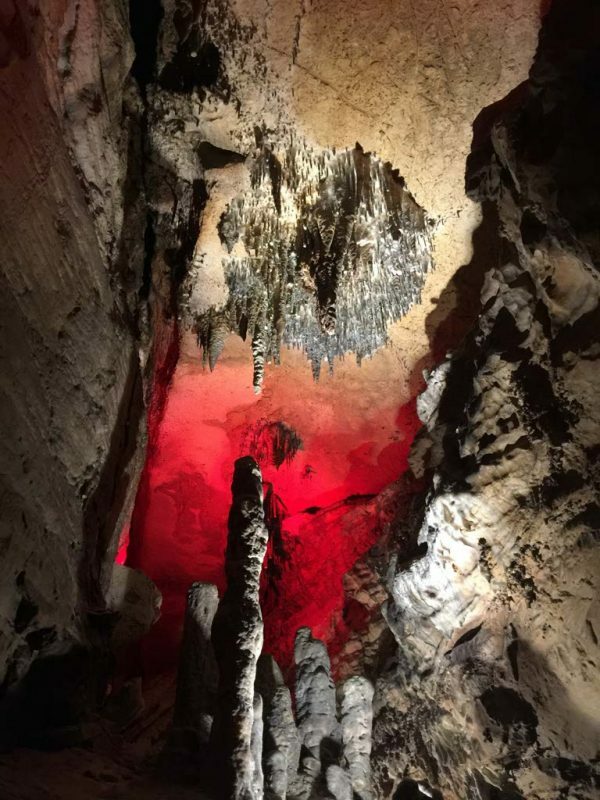 Ruby Falls looks wonderful and your photos are fantastic. The Basilica Cistern in Istanbul was pretty cool and was sort of like caving, we definitely will be looking for future opportunities to do a little cave exploration. The place is absolutely beautiful. The colors are amazing. I would love to explore this one day. The waterfall looks spectacular! I love all of the color lights. What an amazing place to experience! This is absolutely gorgeous! I have never even heard of this place, but it is definitely a place that I would like to visit! Chattanooga is so close to me. It’s just a day trip. I’ll have to plan a trip to check this out. WOAH! What an awesome adventure, I have not been caving in forever, would love, love, love to see this. The colours are fabulous, makes it less scary when it is bright and pretty huh?! I didn’t realize this existed either!! Will be added to MY list now for this year! This makes me want to visit Chattanooga again! I had no idea these falls were there! How cool! 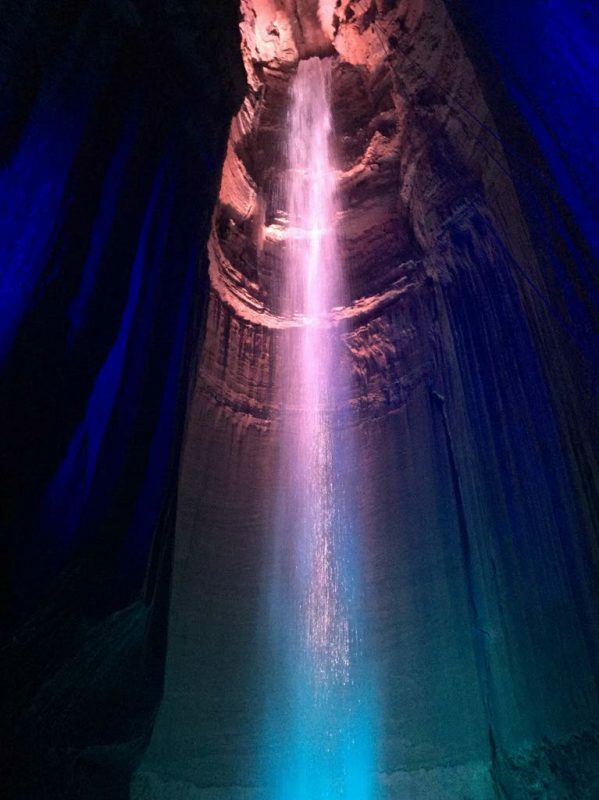 I love those Ruby Falls – just stunning! I’ve been caving before, and while it can feel quite claustrophobic, it’s such an amazing experience. Your photos would make me travel to Chattanooga just for this opportunity.